This page compares Analog Comparator vs Digital Comparator and mentions difference between Analog Comparator and Digital Comparator. 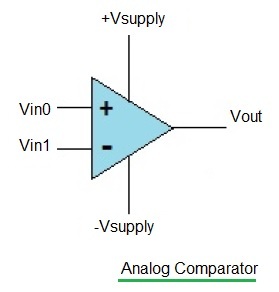 Definition: The Analog Comparator is a circuit which compares two analog voltages available at the inputs and generates output based on which one of the inputs is greater/lesser to the other. This is shown in the figure-1. It is basically amplifier without feedback. Hence it will usually have higher gain. As shown analog comparator compares two input voltages viz. Vin0 (at positive terminal) and Vin1 (at negative terminal) and produces Vout based on these. In microcontroller based designs, GND is considered as -Vsupply while Vcc is considered as +Vsupply. This is due to the fact that no negative supply is available here. Definition: The digital comparator is a combinational circuit which compares digital binary inputs and produces different outputs indicating relationship of digital inputs. The circuit is also known as magnitude comparator. 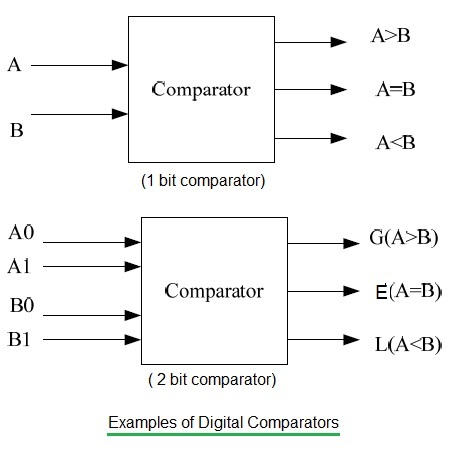 Based on number of inputs there are different types of digital comparators. There are two inputs A and B. The output of it is usually 3 binary variables which indicates A>B, A=B and A<B conditions. There are four inputs (A1,A0) and (B1,B0) and three outputs. The outputs indicate E, G and L.
➨ E is equal to 1 when two input numbers are equal. Based on KMap and truth table, we will have following equations.